(TibetanReview.net, Jun14, 2015) – In further tightening of control and restrictions on a Tibetan Buddhist monastery in Tridu (Chinese: Chenduo) County of Yulshul (yushu) Prefecture, Qinghai Province, China has begun strictly enforcing government limit on the number of monks allowed to be enrolled there. Those found to be residing and studying at the Nyatso Zilkar Monastery without having received permission from the relevant Chinese government departments were being expelled, reported Radio Free Asia (Washington) Jun 12, citing local sources. 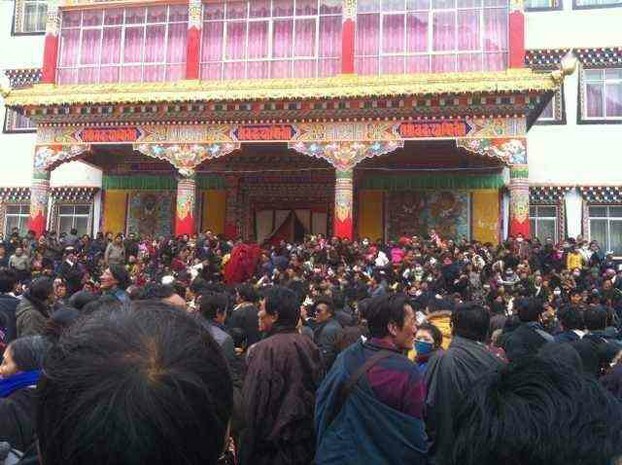 “Only those who are registered within the approved quota of monks assigned to Zilkar will be allowed to remain there,” the report quoted one source as saying. Under Chinese rule, Tibetans are not allowed to become monks unless they are at least 18 years old. And in order to become a monk and enrol in a monastery, a Tibetan should receive clearance and permission from several government departments, including the police and the local religious bureau. And monasteries cannot enrol monks beyond the limits set by the Chinese government. Monks who fail patriotism tests, or who are found involved in protests against Chinese government, or who do not belong to the local area, are all expelled. The same applies to nuns. Monks of Nyatso Zilkar have, in recent years, led protest marches and held prayers for self-immolation protesters. As a result, they have faced severe and repeated crackdown from the Chinese government. The report noted that on Feb 8, 2012, about 400 monks of Nyatso Zilkar launched a seven-mile “solidarity” march but were stopped by security forces halfway at a bridge, angering hundreds of local residents who then joined the demonstration. It was not clear how many monks Nyatso Zilkar currently had and how many were seen likely to be expelled. Many monasteries in Tibet have monks in excess of the official quota due to the severity of the limits imposed by the Chinese government and the difficulty of getting the relevant clearances and permits to join them. The report said Nyatso Zilkar was continuing to see its monks being pursued and detained by Chinese authorities for suspected involvement in protest activities. A monk named Tsultrim Woeser was taken away on Jun 10 and detained for two days before being released but barred from returning to his monastery, the report said. Friends were said to suspect that he may have been targeted for his use of the online social media and due to his previous travels to Tibet’s capital Lhasa and to Qinghai. Also, on Jun 11, Chinese police came looking for a monk who was studying at Nyatso Zilkar but belonged to a Tibetan area in Sichuan Province. However, the police returned empty handed as the monk had already left, the report added.